Pass out the goodies in colorful paper treat bags from ShopWildThings. Choose from a dozen colors in chevron patterns, polka dots or bold stripes to match a party theme or show off your favorite color. They're great for kids' parties and just as much fun for kids at heart. At 5 inches by 7 inches, these paper goodie bags are the perfect size for homemade cookies, a handful of gourmet candies or dried fruits and nuts. They're sold in eight-count packs, and coordinate perfectly with our paper straw sets. Brighten up a so-so day at the office by dropping a colorful paper bag of treats on the desks of your co-workers. They're delightful take-away bags for community fundraisers. A handful of candy hearts in a red polka dot paper party bag secured with satin ribbon is a charming party favor at Valentine's Day celebrations. Pack our little paper sacks with peanuts for fans in the stands at that next softball game. Reward your event planning crew with little treats in festive paper bags. Our team has just as much fun creating collections for casual get-togethers and impromptu parties as we do for formal galas. Sign up to receive our e-newsletter to learn about new products and special deals throughout the year. 1 LOT AVAILABLE! 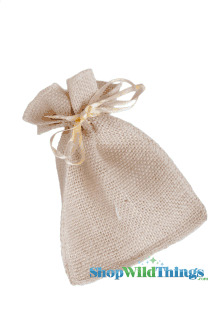 CLEARANCE Burlap Pouches 4" Wide x 7" Tall - Natural - 36 Bags of 12!